Problems within your drainage system may become apparent by the drains blocking and backing up, however often breakages in the drainage network will occur and can go unnoticed for years. Breakages in the drains can allow pollutants to escape from the drains into the ground causing soil and groundwater pollution. For both issues it is important to identify the location and cause of the problem and ensure an adequate repair is made. The CCTV survey is conducted by inserting a remote controlled camera into the drain run which relays the video footage to a computer above ground. This allows the operator to identify any issues and to control the camera accurately. Often silt build up will prevent the camera from moving freely through the drains and can cause the survey to be aborted. For drainage systems where silt build up is suspected we recommend jetting the drain in conjunction with the CCTV survey to flush out any debris and allow the drain to be surveyed unobstructed. Our CCTV drainage surveys can assess the condition of your drainage to identify any defects such as collapses, missed connections, breakages, blockages and root ingress. You will be provided with a report detailing any defects with accompanying video proof highlighting the problems. 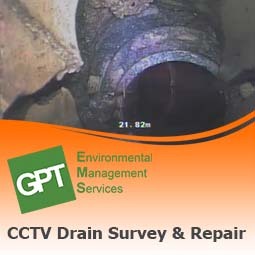 If the CCTV survey does identify problems within the drains we are able to conduct most drain repairs. Full site CCTV drainage surveys will also be accompanied by a colour coded CAD (Computer Aided Design) drain plan showing the drains onsite. CCTV Drain surveys can be run in conjunction with our drain tracing/drain mapping surveys to confirm connectivity where traditional methods have failed. Drains can collapse for a wide variety of reasons, there way be too much pressure/weight above them, there may be subsidence or uplift or the drains may be damaged by chemicals attacking and weakening them. If a drain does collapse it can cause the drains to back up and cause flooding and can allow pollutants to escape to ground. Unfortunately if a drain has collapsed it may need to be replaced. This has to be done by excavating and replacing the pipe for the stretch that has collapsed. This is usually an expensive process especially where there is made ground above e.g. tarmac which needs replacing after the repair has been completed. We can undertake drainage excavations and replacements, however we would always look to avoid excavations if no-dig/trenchless drain repairs can be conducted. Where drains have broken but not completely collapsed it is possible to use trenchless or "no-dig" technology to repair the drain without the need for excavation. No dig drain repairs are faster, less intrusive, more environmentally friendly and cheaper than excavating and replacing drainage. No dig technology is effectively creating a marginally smaller pipe inside the existing one. A liner is installed into the drain run and expands to form a pipe within a pipe. This is then cured in place creating a new pipe, where connections have been blocked a robotic cutting unit is utilised to cut through the new drain reopening the connections, repairing the drain at a minimum cost and disruption to the client. We can reline whole drain runs or for smaller defects can install patch repairs. It is effective for drain runs of any size between 10 cm diameter right up to 150 cm diameter, patch liners for smaller repairs can be installed in drains from 6cm diameter up to 120cm diameter. Where blockages have occurred either due to damaged drainage or due to obstructions causing build ups of silt, fat, grease etc we can clear the blockage by inserting high powered jetting equipment into the drain run. The drain jetting equipment can negotiate bends, clear blockages in long drain runs and clear severe blockages which cannot be cleared using manual equipment. Tree and plant roots are a major source of drain damage, roots in your drainage can cause blockages and if unresolved can lead to even more severe drain damage. Specialist root cutting equipment can be inserted into your drains, cutting through the roots and clearing the obstruction, however the opening which the roots have entered through will still be present. We recommend lining the drain after root cutting to prevent to prevent any regrowth from entering the drain system. misconnections, where your drains have been connected to the wrong part of the sewer network – you must fix any misconnections or you could be fined up to £2,500"